IDN is no organisation, but a project looked after by Tec Dian. It offers a home to all Irish dancers, teachers, adjudicators and friends of Irish culture all over the world. For the members of IDN Irish dancing is above all an expression of human pride, together with respect for humanity. Therefore IDN is open for every approach. Whether dance as passive relish, leisure fun, passion, or competitive sport, everyone is welcome here. We support opening groups and classes, holding certification examinations as well as organizing dancing events. IDN promotes the arrangement of feiseanna open to all dancers independent of school or organisation as well as festivals for all without competitive ambition, in order to bring Irish dancers together and to give them the opportunity to exchange views, learn from each other and have fun together. IDN is no commission who arrogates to themselves to patronise dancing teachers and dancers, and it is also no dancing teachers' association for lobbying for financial interests of business people. Instead our aim is to offer an open platform for all who focus on the dance as such. We want to counter commercialisation, property and power interests, and pressure to achieve, and together we want to make sure that the dance as such will be of highest importance for the Irish dancing scene once again. In a world, where dancing teachers claim rights of property to their pupils and guard dancing steps like state secrets, IDN takes the side of freedom of the dancer and freedom of the art. In a world, where Irish dance tradition is at the mercy of culture-political power interests and history is rewritten at pleasure, IDN takes the side of scientific truth. Within an open platform concept IDN works out scientifically established standards for contents, technique, teaching and adjudication of traditional Irish dance in order to help to preserve and pass on the Irish dance tradition. These standards define what we understand as traditional Irish dance as it developed in the 19. and 20. centuries as sporting art form. Traditional Irish dance is the basis we take as a starting point, because it represents the entire historical development as well as the highest technical perfection of Irish dancing. 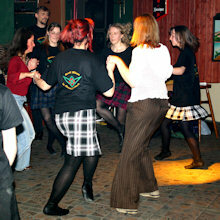 However, basing on this foundation IDN accepts and supports other historical and modern Irish dance styles as well. IDN is open to everybody who want to contribute to this platform. Membership in another organisation is no problem at all. Our greatest hope is that one day the Irish dancing scene will overcome its division.